June is married to (another) Ian and they have three sons and three grandchildren. June helped run Playgroups and Rising Fives here at Baljaffray before ‘being led’ into pastoral care which she really loves. Pastoral Care Co-ordinator means a lot to June as she enjoys being involved with people, different situations and having a good team of pastoral visitors. 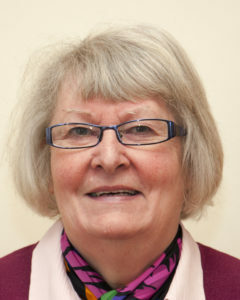 June is also involved in the Prayer Ministry Team, Home Communions, Seniors, Mugdock Care Home and Holiday Club.